Adolescents participating in wilderness and adventure therapy programs are at significantly less risk of injury than those playing football and are three times less likely to visit the emergency room for an injury than if they were at home, a new study by University of New Hampshire researchers finds. These findings, based on an analysis of risk management data from 12 programs providing outdoor behavioral healthcare in 2011, were reported in the latest issue of the Journal of Therapeutic Schools and Programs. 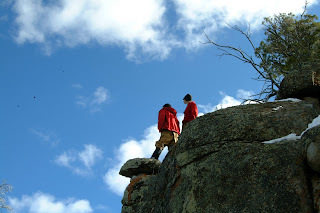 Adventure therapy, described as the prescriptive use of wilderness adventure experiences to improve the mental health of clients, primarily serves adolescents and is often seen as a treatment of “last resort” for these youth, who typically present with three or more dysfunctional behaviors such as depression, substance abuse, and suicidal ideologies. Gass, a leading expert in the field, estimates that there are more than 200 such programs nationwide ranging from multimillion dollar programs to individual counselors who might informally take a group or class into the woods. For this study, Gass and Javorski looked at incident and illness data collected by the 12 adventure therapy programs that comprise the Outdoor Behavioral Health Industry Council for 2011. Analyzing injuries that required a client be removed from regular programming for more than 24 hours – including injuries treated in the field as well as those that required evacuation to a medical facility -- the adventure therapy programs had an injury rate of .11 injuries per 1,000 days in 2011, or one injury for every 9,091 client-days. The estimated national average rate of injuries for adolescents treated in U.S. hospital emergency rooms was three times that rate (.38 per 1,000 days). Adventure therapy programs boast even stronger safety records when compared to other common activities of adolescents. Injuries during high school football games are more than 140 times greater than those in adventure therapy programs, which boast lower injury rates than snowboarding, downhill skiing, mountain biking, backpacking, and football practice. The researchers offer several reasons for the dramatic relative safety of these programs. As the field has developed, says Gass, risk management standards have improved; he notes that the programs in the OBHIC are among the leaders in the field. And our perception of risk colors how we view the risk of “everyday” activities. What’s more, the effectiveness of these programs makes them not just safe but saviors to parents of the very troubled adolescent clients. “Many parents say, ‘this is the one thing that can save my child,’” Gass says. He and his colleagues are researching how and why adventure therapy works, but he is confident that their potency is at the intersection of adventure programming and therapy. “The pill that we’re offering is the positive use of stress coated by appropriate levels of care and support,” says Gass, co-author of the leading academic and training text in the field, “Adventure Therapy: Theory, Research and Practice” (Routledge, 2012). In response to the growth in the wilderness therapy field, UNH launched the nation’s first dual social work-outdoor education degree in 2009; the two-and-a-half-year program awards both a master’s in social work and a master’s in kinesiology. Graduates of the program, administered by Gass and Anita Tucker, assistant professor of social work, are all working in the expanding field of adventure therapy. The member-programs of the Outdoor Behavioral Healthcare Industry Council that provided incident data to this study are the Anasazi Foundation (Ariz.), Mountain Homes Youth Ranch (Utah), OMNI Youth Services (Ill.), Open Sky Wilderness Therapy (Colo.), Redcliff Ascent (Utah), Second Nature Cascades (Ore.), Second Nature Entrada (Ore.), Soltreks (Minn.), Summit Achievement (Maine), Legacy Outdoor Adventures (Utah), Outback Therapeutic Expeditions (Utah), and Wendigo Lake Expeditions: REACH (Ontario). This study was funded by the Outdoor Behavioral Healthcare Industry Council (OBHIC). Caption: University of New Hampshire professor Michael Gass (left) and doctoral student Steve Javorski found that adolescents participating in adventure therapy programs are at significantly less risk of injury than those playing football and were three times less likely to visit the emergency room for an injury than if they were at home.